How is information sent and received inside the brain? It turns out that the answer may be even more complicated than we had thought. We have long known that the neuronal synapses are central to the brain’s ability to process and communicate information. Using electro-chemical signals, neurons can activate each other and create intricate networks with immense computing power. With around 200 billion neurons in a single brain, and the possibility of hundreds of thousands of connections from a single neuron, the brain can process a vast amount of information. And now, new research out of Case Western Reserve University suggests that we may use electrical fields to communicate information across different sections of the brain. With all the electro-chemical processes going on in the brain, it’s not a surprise that the brain generates weak electric fields. And we have understood for a while now that, when those electric fields aren’t under control, we’re in big trouble. This is what happens in the brains of people who have epilepsy. Some researchers have previously suggested that electric fields might be an important part of a brain’s typical functioning as well. They theorized that electric field generated by the neurons may cause feedback that alters the neuronal behavior. 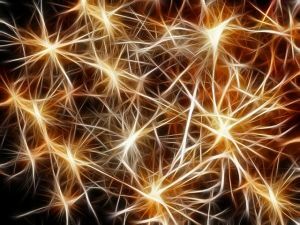 This means the neurons could be communicating with parts of the brain that they are not directly physically connected with. Researchers at Case Western Reserve University have expanded on this hypothesis. They found spikes in neural activity that they were traveling slower in the brain than they would expect if they were operating through the typical brain mechanisms. Since the low-amplitude electric fields travel through the brain at a speed of around 0.1 meters per second, much slower than the typical firing neuron, they offer a compelling explanation for this phenomenon. Researchers tested this hypothesis with experiments using computer modeling and in vitro tissue. The results were consistent with their predictions. The exact function of these fields is still unknown—hey may play a part in regulating brain functioning and communication, or perhaps they serve more direct information transfer purposes. This work could help us make progress in better understanding and treating conditions like epilepsy. It also has deep implications for cognitive science and any serious attempts to model the functioning of the human brain.